I haven’t posted anything for the Sunday Stash show-and-tell in awhile. I thought it would be fun to share my latest acquisitions. It seems like these Little Folks voile fabrics are getting harder to find. Many shops are sold out of many prints, so I thought I should stock up on this set of fat quarters. I am thinking about making either simple patchwork quilt of squares pieced together and framed with a solid binding, or maybe I will get brave and make this dress pattern, but in a shorter length. 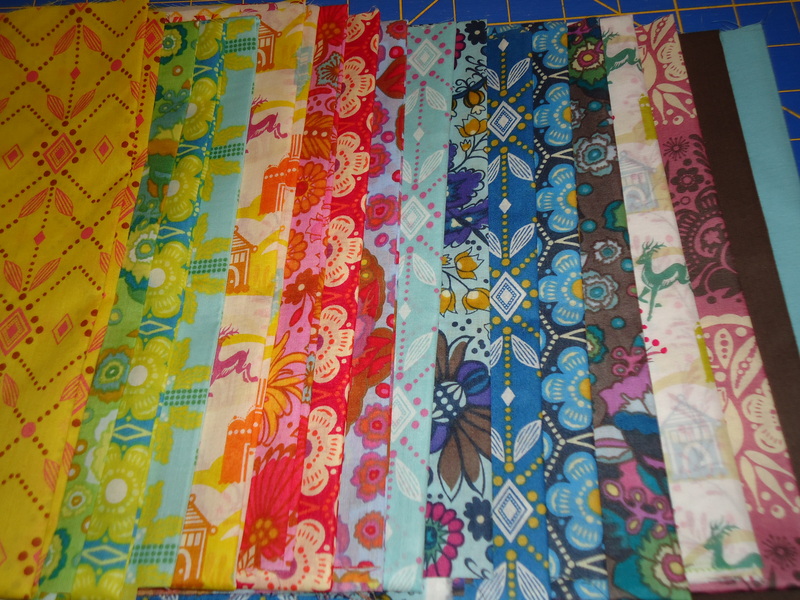 I bet this stack would make another great dresden plate color wheel quilt too! Until then, I am going to enjoy just looking at this beautiful stack of fabrics. I think you would look so great in that dress! Just think how cool and soft it would be in that fabric! I’m still working on the dress like that that I started last Summer, I’m ashamed to say! I love your latest acquisition of fabrics. I think they would look beautiful in anything you decide to make. I’ve seen that new dress pattern and agree it would be cute made a little shorter. There are so many pretty fabrics out, I can’t sew fast enough. Oooooooo! You are reminding me that I need to get my hands on some more of this voile before I can’t find it. I can’t wait to see what you make! What a fun collection of fabrics. Eye candy! They are so pretty. I think the dress would be fun to wear. Good luck on deciding what to make with them. I love Little Folks voile!! I have several prints just waiting for the perfect project! Your collection is so pretty! I love these fabrics too…but just haven’t found the right project for them yet! so pretty! i recently purchased some little folks for the first time and the fabric is amazingly soft. i can’t wait to make a shirt out of it. The fabrics are so inspiring! I can’t wait to see what you make! Lemme know how these work for you! I’ve had trouble cutting/seaming, etc. They’re so soft and buttery (yum!) but I can’t seem to get them to cooperate with me.